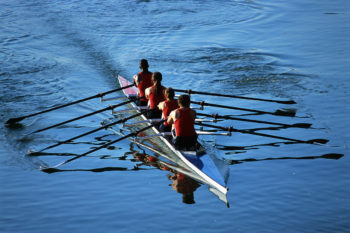 One of the hallmarks of high-performing teams is collaboration. Conflict and drama make great stories, but great collaboration leads to enduring successes. Often the behind-the-scenes stories are better than the original. Most successful collaborative efforts are not two-person teams, but teams composed of individuals with diverse backgrounds and perspectives. When working together, these teams will usually outperform any individual. You are on a ship at sea. After fire breaks, your ship starts sinking; you are lost at sea. Your location is unclear, but you are at least one thousand miles away from the nearest land. You have one life raft and oars. You are given a list of fifteen additional items to rank in order of their importance to survival. You rank them first by yourself, then as a team. Unless there is a seasoned sailor in the room (yes, I actually had a licensed mariner in one of my sessions), the team will almost always outperform each of the individuals. I have done this exercise with hundreds of individuals. Again, the team almost always outperforms the individual. I did, however, have one bona fide failure and it taught me an invaluable lesson. We had completed all the individual ranking, created a short introduction to the distinction between consensus-driven decision-making versus other styles of decision-making, and the teams were about halfway to finishing their team exercise, when a new team member walked in – late. He had completely missed the individual exercise and plopped himself into one of the six teams working on the team ranking. Wanting to make up for his embarrassingly late appearance, he worked feverishly with his team to get the items ranked correctly. Within fifteen minutes, he had completely hijacked the team, rearranged all of their rankings, and lowered their final score by fifty percent. It amazed me how, despite the best of intentions, one person can take a whole ship off course. I have subsequently seen this same scenario repeated multiple times, mostly by management. Which only goes to show you…Sometimes no management is better than any management.